The crux of keeping any business afloat is generating new leads and ultimately customers. Now matter how well established your business may be, there always tends to be a natural turnover of the customer base for a variety of factors. Even if you endeavour to keep everyone of your customers as your number one priority there are always factors outside your influence which mean that you lose customers. At Acceler8 Media we tend to think of our customer base as a leaky bucket. As we deal with a large number of SME businesses there tends to be a natural loss due to external factors e.g. retirement, closing the business, cashflow problems etc…. All of these things are outside of our control and no matter how good the work is that we have done for these customers they will always end up leaving. As such, in order to at least maintain the customer base and ideally grow it we are always looking to engage new clients. Social Media is one of the services we offer to businesses, but it is also a massively important source of new work for ourselves. It wouldn’t be fair for us to preach the benefits of Social Media to our clients if we didn’t use it as a key resource in our own development. We have a number of followers on Twitter and they are made up of genuine businesses and networking opportunities. We focus on organically attracting business followers in and around Lancashire. Because of this it is fair to say that we probably generate at least one direct message a week enquiring about our services purely from our Twitter activity. This is in addition to our Facebook referrals which seem to be generated as a matter of course through referral from our customers individual accounts. However, I think it is fair to say that we have never really capitalised on the power of Linkedin and the massive potential it offers for networking and referrals. We have decided that is definitely something we need to improve over the coming months and have found an excellent infographic with some great tips on how to use Linkedin. We think a lot of the information is invaluable and hope that some of our avid blog readers will benefit as well. Watch this space and we will share any good news we get via our new Linkedin campaign! 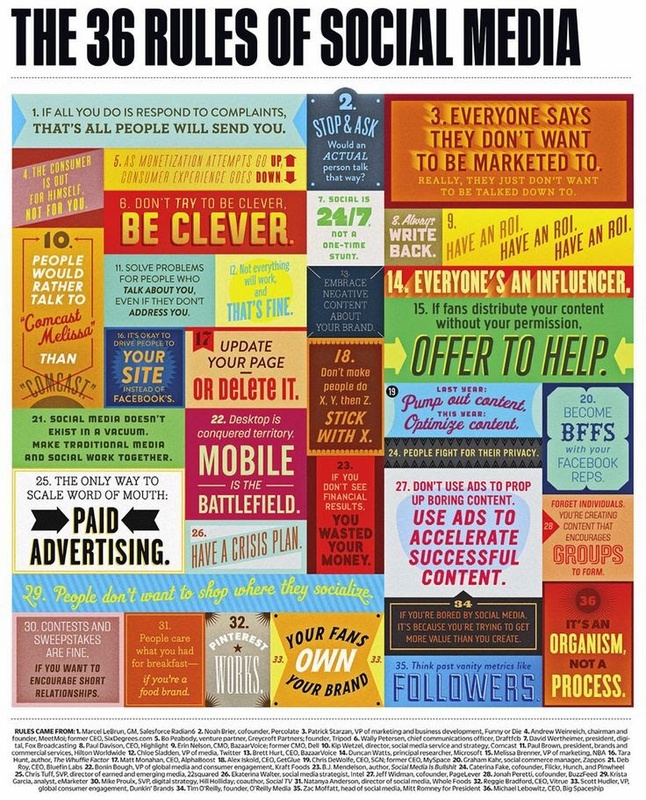 The 36 Rules of Social Media – Do You Abide?